Retail investor Jeff Sutton, along with his frequent partner SL Green Realty, obtained approximately $150 million in proceeds from a mega-refinance of 724 Fifth Avenue, according to city property records and industry sources. The building is the Midtown flagship location for Italian luxury brand Prada. 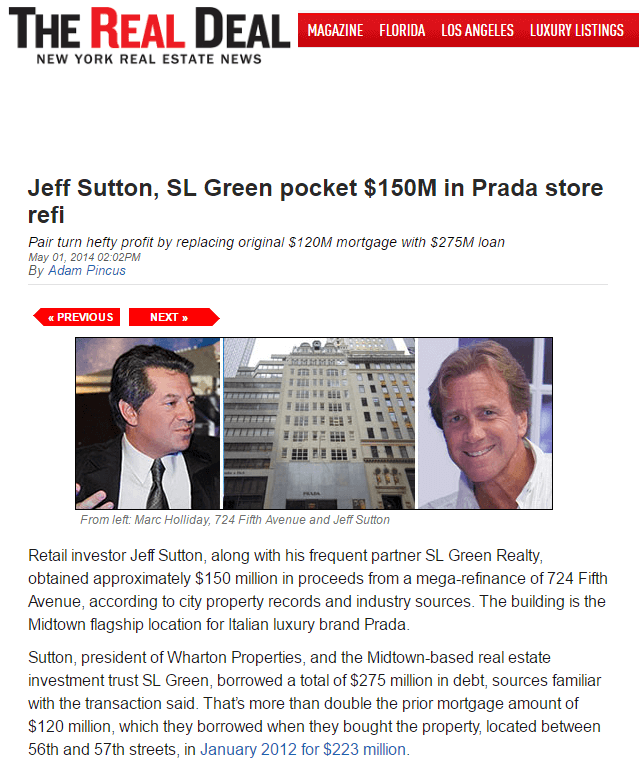 Sutton, president of Wharton Properties, and the Midtown-based real estate investment trust SL Green, borrowed a total of $275 million in debt, sources familiar with the transaction said. That’s more than double the prior mortgage amount of $120 million, which they borrowed when they bought the property, located between 56th and 57th streets, in January 2012 for $223 million. The proceeds of approximately $150 million were divided between Sutton and SL Green, an insider said, and come just five months after the team signed Prada on for an early renewal for 20,000 square feet at the building that will keep them there until 2028. The investment bank Goldman Sachs provided $235 million in first mortgage debt, city records show, replacing the $120 million held by California-based Wells Fargo. The deal closed April 9 and was recorded yesterday. The financial brokerage firm Meridian Capital Group represented the borrowers in placing $40 million in mezzanine debt, sources said. It was not known who purchased the loan, however. Lenders are competing with each other to place debt on properties generating cash flow, said Scott Singer, president of the investment advisory firm, Singer & Bassuk Organization. He was not involved in this transaction, and it was not known what the interest rate is for the mezzanine debt.